Educating researchers in Asia about early detection and correct identification of rust fungi is not only beneficial for countries like Vietnam, but also Australia as it facilitates the pest risk analysis process for agricultural imports and provides early warning of new and emerging plant diseases in the region. 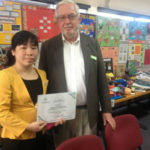 Ms Tran Yen Chi, a plant pathologist from the Vietnamese Plant Protection Department visited Australia late last year with the support of the Crawford Fund. Based in the state-of-the-art microbiology and molecular laboratories at the Ecosciences Precinct in Dutton Park, Queensland, Ms Chi worked under the guidance of mycologist Dr Roger Shivas from the Department of Agriculture, Fisheries and Forestry, Queensland. During Ms Chi’s visit she learnt molecular and morphological diagnostic techniques to identify plant pathogens – in particular, rust fungi. Ms Chi had also visited Australia back in 2011 with help from the Crawford Fund in order to participate in a survey of rust fungi in northern Australia and attend the Australasian Plant Pathology Conference in Darwin. During her latest visit she was able to complete a manuscript listing several new records of rust fungi that she had collected in Vietnam. “A highlight of my visit was an invitation to attend the Awards Day at the 2013 Hermitage Research Facility Schools Plant Science Competition. With support from Dr Shivas, I made a brief presentation on “Finding the fun in fungi: our work as plant pathologists in Australia and Vietnam”. I hope to return to Australia to study for my PhD, working with rust fungi,” Ms Chi said.